"The Highlanders of High Albania." Nicolay, Prince of the Vasoyevich, or Prince des Wassoevitch as he calls himself in French, was the author of some French-language essays and letters on the mountainous region along the present border between Albania and Montenegro. He was active during the reign of Prince Petar II Petrovic Njegos (r. 1830-1851) of Montenegro, and seems to have first-hand knowledge about the highland tribes of Albania and Montenegro at the time. Little else is known of him. Ancient Holmia (Mountains) is situated between the Adriatic Sea, the Bay of Kotor, Bulgaria and Old Serbia, between Herzegovina, Lake Ohrid, Elbasan and Durrës. It now forms the entirety of High Albania, part of Herzegovina, Bosnia and Old Serbia. It is about 51.3 leagues long and about 30.8 leagues wide, which makes about 1,580 square leagues. It has a population of about 320,000 souls, of whom 74,000 fighters and 5,400 cavalry. The country is covered in mountains and steep cliffs, gorges and regions that are so inaccessible that from ancient times up to the present, no armed force has been able to penetrate them. I do not wish to go into topographical details about the country because it is too vast a subject and would require much more careful and special treatment. I would just like to note that it is very difficult, if not impossible, to get an accurate idea of the nature of this country and of the frightening aspect of its mountains. Every step one takes, one encounters a fort, every stone is a defensive wall that nature created to stop men from advancing. In short, High Albania is a perfect natural fortress that no power has ever been able to conquer or subdue. History tells us that the Romans, and even the Turks, were masters of this country. This is true, but in the sense of stipulations that fulfilled the needs of these tribes, and not by force of arms. Ancient Holmia derives its name from a lofty mountain called Holm, situated in the tribal land of the Vasoyevich against the Turks of Kolashin. Holmia is now divided into two parts. The first are the independent mountains comprising Montenegro and Brda (ancient Holmia). The second are the mountains dependent upon the Porte for their pastureland and markets, but who pay nothing to the Turks and govern themselves. The people who now inhabit this country are of two different races: Albanian tribes and Slav tribes. The Albanian tribes or Skyptars are the descendents of Illir, son of Cadmus, King of the Phoenicians, who left his country on the arrival of the Israelites, travelled with this son and his people to settle on the banks of the Adriatic Sea, from Greece to Lake Shkodra, a position that they have held up to the present, without having altered their costumes and customs. Their language has also remained to the present day just as it was thirty-three centuries ago. This language bears no resemblance to languages to the north of it, except for technical terms and titles taken from their masters. All the Albanians are Roman Catholic, but out of a dislike they have for the pope and the Latin language, they hold the clergy in low esteem and are little devoted to their religion. The Slavic tribes inhabiting these high reaches are Ostrogoth Slavs who took over the country under King Sverlade and his son Ostrovoy or Ostroyl at the time of the Roman emperors Anastasius and Justin in 495. They are all of Greek Orthodox religion and are devoted to their faith to an almost fanatic extent, but the clergy has lost much of its original influence. The mountains independent of the Porte are completely free and independent. Since 1389, they have been in continuous warfare with the Turks and have never made peace with them up to the present day, nor recognized any of their laws. The great Turkish rulers have never been recognized by them as legitimate sovereigns of the Slav Empire, but only as pirates and henchmen who have taken over their country in the most vile and shameful manner, at the head of a mass of homeless vagrants and evildoers without a nationality, profiting from the discord that reigned among the Christians. What is more, history has acknowledged the infamous and atrocious conduct of all the Turkish sultans against the Christians. The independent tribes are firmly and energetically resolved to die rather than to submit to the yoke of any outside power. The mountains independent of the Porte are also divided into two parts: 1) the 24 tribes of Montenegro, consisting 70,000 souls and where the Vladika of Montenegro is the absolute ruler, constitute real Montenegro; 2) the Brda (Holmia) composed of seven large tribes independent of one another where each tribal chief is absolute master of his people. The Brda are also called the Seven Mountains and consist of 42,000 souls. The Uskoci (a people living in a sort of federation with the mountains) consist of 22,800 souls, and with Montenegro and the Seven Mountains form a total of 134,800 souls who are able to muster forces and move within twenty-four hours. However, should needs be, if there is a general attack on their country, this number can be doubled. The mountains dependent on Turkey are the tribes of Herzegovina, consisting of 32,800 souls, the five tribes of old Serbia consisting of 28,800 souls, the seven tribes of Dukagjin consisting of 48,000 souls, the tribes of Mirdita with 20,000 souls, the tribes of Dibra with 24,000 souls, those of Lura with 4,000 souls, and the tribes of Zadrima with 8,000 souls, which make up a total of 184,400 souls, of whom 46,300 men-in-arms. The tribes of Montenegro are not native to this country. They are made up of various families of Ostrogoth Slavs, Bosnians and, most of all, inhabitants of Herzegovina. They date from 1500. The most famous Montenegrin tribes are those of Catuska-Nahia, from whom the Vladika of Montenegro descends and who were never subjugated by the Turks or the Venetians. In 1711, the Russian czar, Peter the Great, sent them treaties and patent letters with many promises he never intended to keep, to get them to take up arms against the Turks. This marks the beginning of Russian relations with these tribes. In order to acquire a bastion on the Adriatic Sea and to promote its political objectives in the heart of civilised Europe, so to speak, Russia, giving various pretexts, bestowed upon the Vladika of Montenegro a pension of 85,000 francs a year, but the real objective of this was to attach all the chiefs of the warring tribes to the Russian side. The tribes of the independent mountains are native to the country. This is ancient Holmia and Podgora. They go back to the year 495, but their separation into tribes began in 1160 when the last Slav king of the Ostrogoths in Dalmatia, Radoslav the 45th, persecuted by one of his generals called Dessa to whom he had shown great favour and generosity by making him Prince of Rascia, was obliged to withdraw into the mountains with his four sons, Vaso, Kraso, Hoto and Pipo, and all his relatives. The descendents of these four sons created the four great tribes: Vasoyevichi, Krasniqi (Dukagjin), Hoti and Piperi, and they have preserved their freedom and independence there to the present day. In case of general peril, i.e. in a war against the Turks, they join forces with the Montenegrins. The war that began in 1476 and has lasted ever since, the day-to-day killings and massacres with the Turks, with ravage and desolation, are the cause of the poverty of the mountains and of Montenegro. This terrible struggle has deprived them of all communication with the outside world, to all effect with mankind. They have no culture, no trade and no industry. Hemmed in on all sides and surrounded by barbarians, blood-stained for centuries, they have themselves become barbarians in the sense that the life of one man is less valuable than the life of a goat! Such is the terrible life of all the independent tribes and of those dependent on the Porte in High Albania! There are two princely families that stem from the ancient dynasty of the independent tribes. In the Krasniqi (Dukagjin) tribes is the princely family of Aly-tzor blood that was compelled to convert to Islam, but that will return to its original, Christian religion when the right time comes. In the Vasoyevich tribes, it is the princely family of the lineage of Miloshevich, the eldest son of Prince Radoslav (Rayo) who is a fourth-generation descendant of the grand Voyvod, Prince Stephen (Stevo) Vasoyevich. This prince was killed in 1389 at the disastrous Battle of Kosovo Polje. Stephan is the fifth-generation descendant of Prince Voyslav (Vaso), eldest son of King Radoslav 45th. Thus today, the ancient princely family among the Vasoyevich tribes consists of three sons and one daughter who are: Svietoslav, Branislav, Altoman and Elisabeth. The three princes are the sons of Prince Nicolay and Princess Nastasy. In the fourth generation are the descendants of Prince George (Djuro), renowned in Slavic folksongs. In the sixth generation are the descendants of Prince Milosh, the eldest son of Prince Radoslav (Rayo or Radogna). In the eleventh generation are the descendants of the above-mentioned grand Voyvod of Sientza, Prince Stephen (Stevo) Vasoyevich. In the fifteenth generation are the descendants of Prince Vogislav (Vaso), eldest son of King Radoslav 45th. Aside from the princely family in the Vasoyevich tribes, there are two hereditary voyvods: one for the upper Vasoyevich and one for the lower Vasoyevich. The two other above-mentioned tribes, the Hoti and the Piperi, are also governed by hereditary voyvods. The best known tribe in the independent mountains are the Mirdites. This tribe is the oldest in the country. Their chief is the prince of the Doda family, represented today by two princes, Doda and Mark. The Slavic Serb people that inhabit upper Moesia (now called Serbia) never had any tribe, and all the princes, zhupans, kings and emperors originated either from Zaholnica or from Holmia, from the stem of the Ostrogoth Slavs. The reigning family in Serbia were the Nemanja, sons of a priest from the village of Ljubomir in Zaholnica (now called Herzegovina). There are no more descendants of the old Serb dynasty or of old Serb nobility. Milosh, the former governor of Serbia, was the first noble of the Serbs to be accorded the princely title of Begh (bey) by the Turks, but a real prince in Turkish is called Begh-Zade. Aside from them, there is no real Serb nobility in Serbia. 1. Tribal Montenegro is governed by the Vladika of Montenegro, absolute ruler. In the mountains, each chief is absolute ruler of his tribe. The total for the independent mountains is composed of tribes that since 1839 have never been conquered by the Turks. 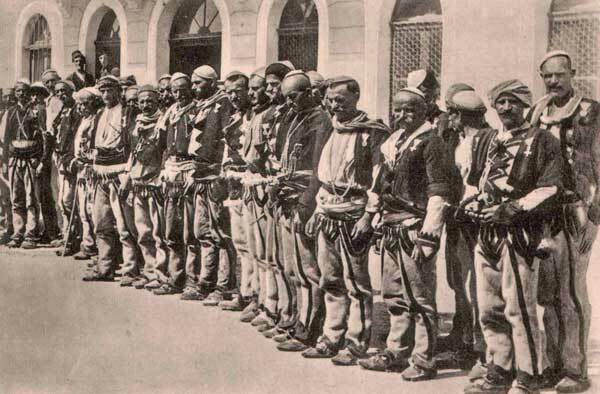 The total of the Albanian tribes in the mountains of Shkodra recognising Turkish rule in some manner for pastureland and markets, but who payno taxes. These are the armed Catholics. The tribes who pay taxes to the Turks and live on the plains and form armies. These are those of Shkodra. Tribes dependent on the Porte for pastureland and markets, but paying no taxes.